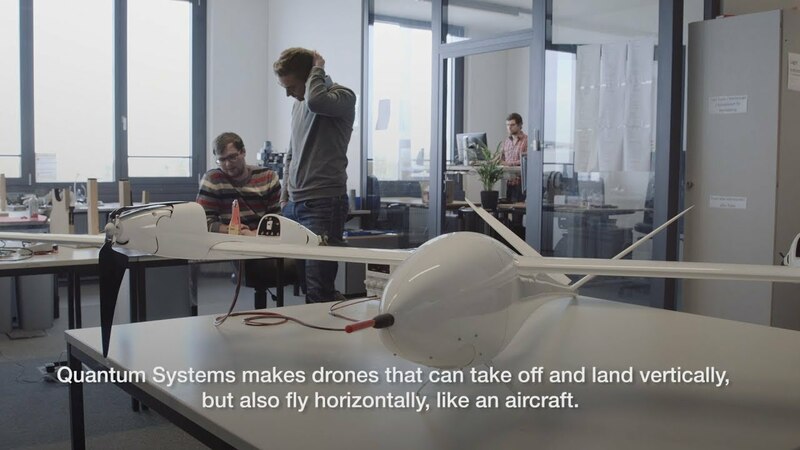 The company Quantum-Systems GmbH was founded in January 2015 and is specialized in the development and production of autonomous transition aircrafts for civilian use. Our products combine reach and efficiency with the ability to vertically take off and land without additional equipment. By means of the founding team’s diversity, Quantum-Systems manages to combine extensive experience and expertise from all relevant areas of unmanned aerial systems. In 2008 we started to conduct research in the field of autonomous flight systems and already in 2012 successfully completed the first autonomous transition. The combination of innovative power and uncompromising focus on quality make us the first choice in the area of transition flight. The Trinity F9 (take-off weight 4,5 kg) combines high efficiency, flexible mission capabilities and has a small footprint. The Trinity F9 is the next evolutionary step for eVTOL UAVs. With improved specifications such as PPK, live air traffic (ADS-B) and anti collision lights combined with an unrivalled price make it the most attractive package on the market today! The three-rotor configuration enables it to achieve perfect VTOL capabilities and a highly-efficient long range flight. The perfect weight balance keeps the tail rotor in the ideal thrust-to-size ratio in both VTOL and forward flight modes. A large payload bay offers enough space for two sensors with a maximum weight of up to 550g. The Tron is a professional high-performing UAV. The system with a maximum take-off weight of 13.5 kg has been designed to flexibly, quickly and safely integrate different sensors in order to meet the needs of a variety of applications. To meet these high demands, the UAV has been designed from the ground up as a fully electric transition aircraft. Our transition technology combines long range and efficiency with the ability to vertically take-off and land without additional equipment. The robust and shock-absorbing cargo compartment of the Tron is capable of safely accommodating even the most sensitive payloads of up to 2 kg. Especially laser-based systems like LiDAR scanners are perfectly suited for integration. Using the QBase mission planning software is the easiest way to prepare an aerial mission for Quantum UAV‘s. It automatically generates efficient flight paths after the flight area and the mission parameters have been defined. These steps allow the operator to be up and flying in no-time. QBase provides real-time information such as updates on altitude, speed, heading and battery capacity at any time. It has a two-tier security system that ensures the success of your mission. The first mission check is integrated into QBase, which performs a capability check while you plan your mission.